Pressure-treated lumber is wood that is engineered for use on projects that are exposed to the elements. Pressure-treated wood typically starts off with one of the SPF varieties (spruce, pine or fir) or other similar softwoods, and a sealant formula is pressure-applied to the wood so that the sealant soaks into the core of the wood. As a result, early in the 21st century, wood manufacturers began experimenting with other formulas, primarily Alkaline Copper Quartenary (or ACQ) lumber. While this new ACQ-treated lumber did not have the issues with the toxicity of the traditional formula, the new pressure-treated lumber had its own problems. In particular, the high levels of copper in the material made it far more conductive, causing increased levels of corrosion in the material as it reacted with traditional nails and wood screws. To combat this problem, manufacturers began offering specially treated screws designed for use with the new ACQ pressure-treated lumber. When buying pressure-treated lumber in the home center, you'll often find that the wood arrives in the store wet. Very wet. Almost dripping wet. This is because of the pressure-treating process. You'll find that wood on the outside edges of the bundles is dried (somewhat), and likely you'll see that the wood is starting to warp outwards, away from the center of the bundle. This uneven shrinkage is because the outer edges have begun drying (and thus shrinking) while the inner-facing sides have yet to be exposed to enough air to begin drying. Since warped lumber doesn't sell, manufacturers want to get the wood to the lumberyard or home center as quickly as possible with all of the wood dripping wet so that it will sell before it begins to dry unevenly. With this fact in mind, when you buy pressure-treated lumber, you won't have time to wait for it to dry before you buy it to see what boards warp and twist and which boards stay straight. Instead, you'll need to find another way to judge what boards to buy. Inspect the long edges of the boards, looking for blemishes or weak spots that may show a tendency for the board to bend around the defect. Additionally, inspect the end grain of the wood. If possible, select wood whose grain lines cross the narrowest span of the end of the board. Boards that have arc-shaped end grain will likely cup more easily than boards whose end grain crosses the narrow span of the board. 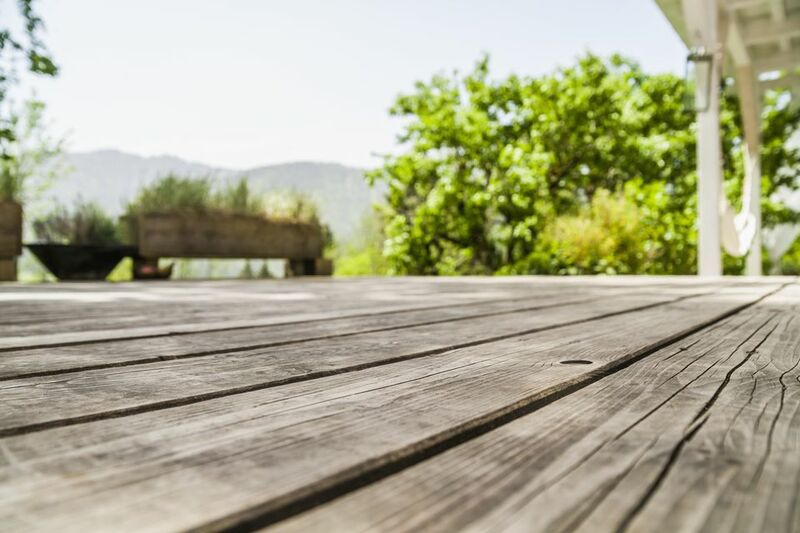 When building a deck or outdoor project that calls for pressure-treated lumber to be installed with gaps between the wood, you'll likely want to install each board butted against the next board as tightly as possible. When the wood begins to the process of shrinkage as it begins to dry, the gaps will appear between the boards automatically. Additionally, to help resist cupping, position any boards with end grain in the shape of an arc so that the center of the arc-shaped grain is pointing away from the adjoining member. So, if you're installing decking onto a framework, the center of the arc on the end grain should point upwards. Be sure to place at least one deck screw through the center of the board to help minimize the bowing as the board dries. Pre-drilling the boards before driving the screws will help maintain the integrity of the wet wood as you drive the screws. A quick change drill driver set on the end of your cordless drill will make the job quick and easy. When working with pressure treated lumber, one should consider a few extra precautions over the normal woodworking safety rules. First of all, consider wearing a dust mask when cutting the pressure-treated lumber. Even though ACQ lumber doesn't have the toxicity issues of previous pressure-treated woods, the sawdust can be irritating to the lungs. As such, you should also do all of the cutting of the wood outside, to allow the breeze to help dissipate any airborne sawdust.